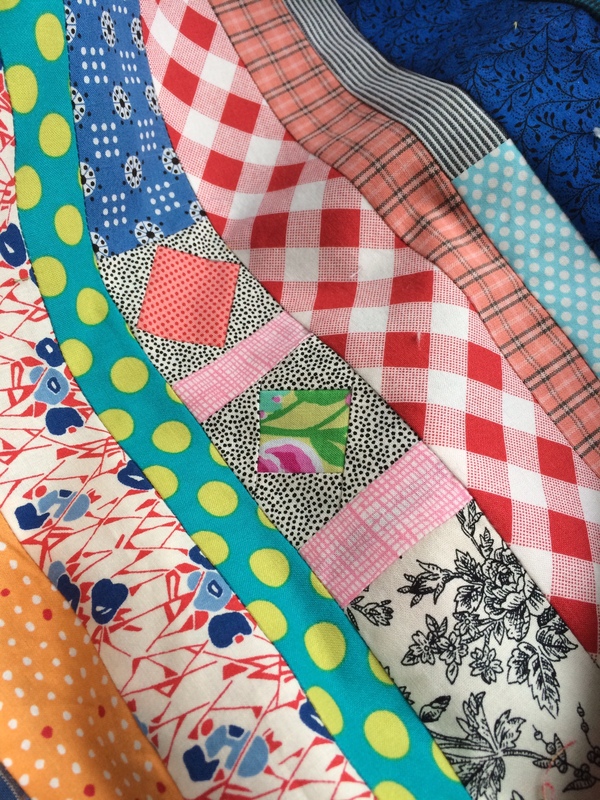 I don’t know how much I have described my quilting style, except that if you follow me on this blog or other forms of social media, you may know that I work in a liberated form of quilting. Slow quilting for sure. Making parts and pieces with design decisions along the way. Generally no patterns (there are exceptions occasionally). I also work from a design wall. Putting up bits and bobs and leaving them there as I work, sometimes for weeks, or months. OK, usually months. Truth be told sometimes I take stuff down because I get tired of looking at it and working on it. I’ll put up another WIP or start something new then come back to the original. Or not. As a result of this method what I am working on typically does not travel well. Taking it off the wall seems like too much effort. 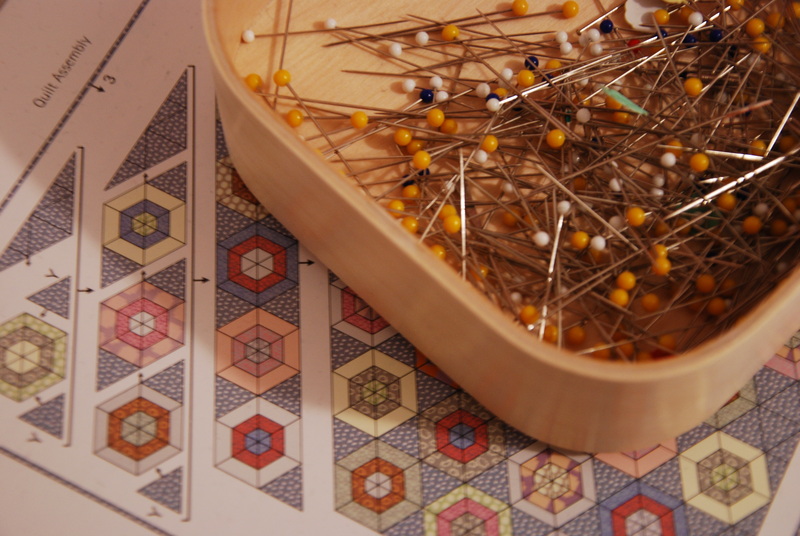 When I travel to my quilting bee at friends’ houses (we rotate who hosts) it can be difficult to know what to stitch. Last fall I grabbed a bin of overflowing strings with the intention of starting a series of log cabin experiments. The first would be a single log cabin block, worked in the round. Some people would call this improvisational. I don’t. Whatever. I started this quilt without an intended recipient. Quilting for quilting sake. No rules. Embracing the wobble. It was quick stitching. About 2.5 feet wide in one night. But life throws you curveballs. In early January my aunt was diagnosed with lymphoma. Overnight this quilt had an intended purpose, no longer relegated to giving me something to do as an entremet to my main project. 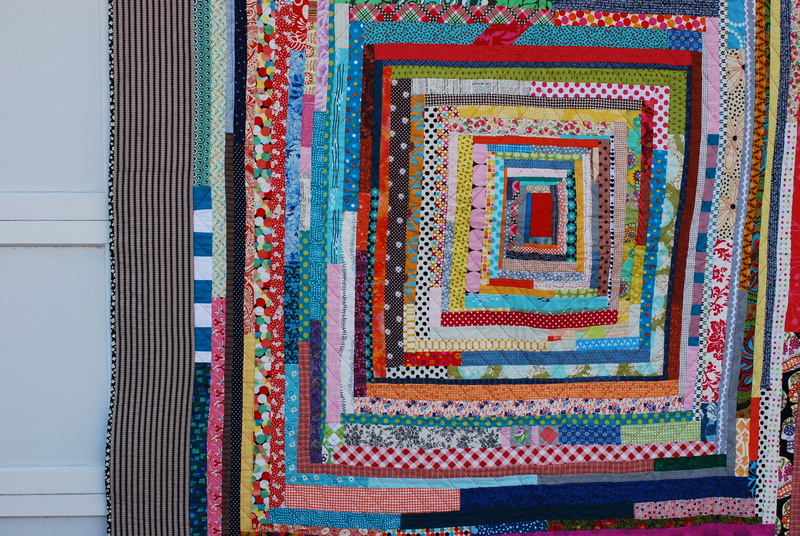 The beauty of this type of quilt is its meditative nature. Each string is attached in the round with stitches love, and hope, and strength into the seams. A prayer quilt (yes even non-believers pray sometimes). I worked fast to get it finished and gifted. Some things can’t wait. It uses some coveted fabrics like fancy French cake fabric purchased in Tokyo. 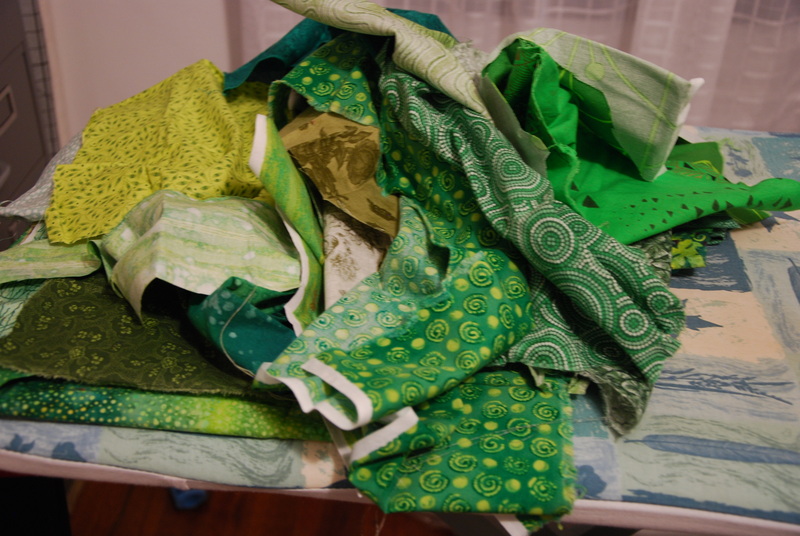 What is the point in hoarding saving these fabrics anyway? They should be used, and loved. This quilt doesn’t lay flat despite my best efforts to press it into submission. And it is certainly not square. 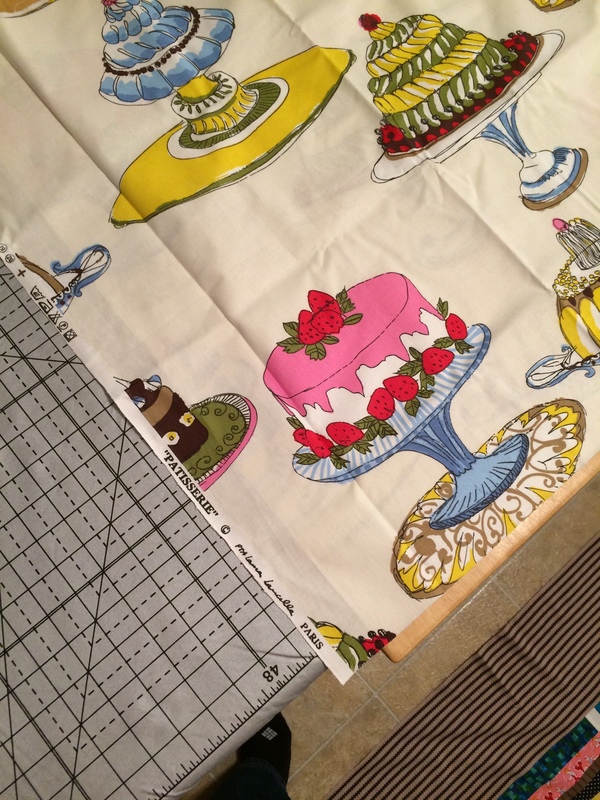 I actually thought it best to just trim it up freehand (sans ruler or measurements) on the kitchen floor after quilting since nothing else in it is square. It seemed the right thing to do. 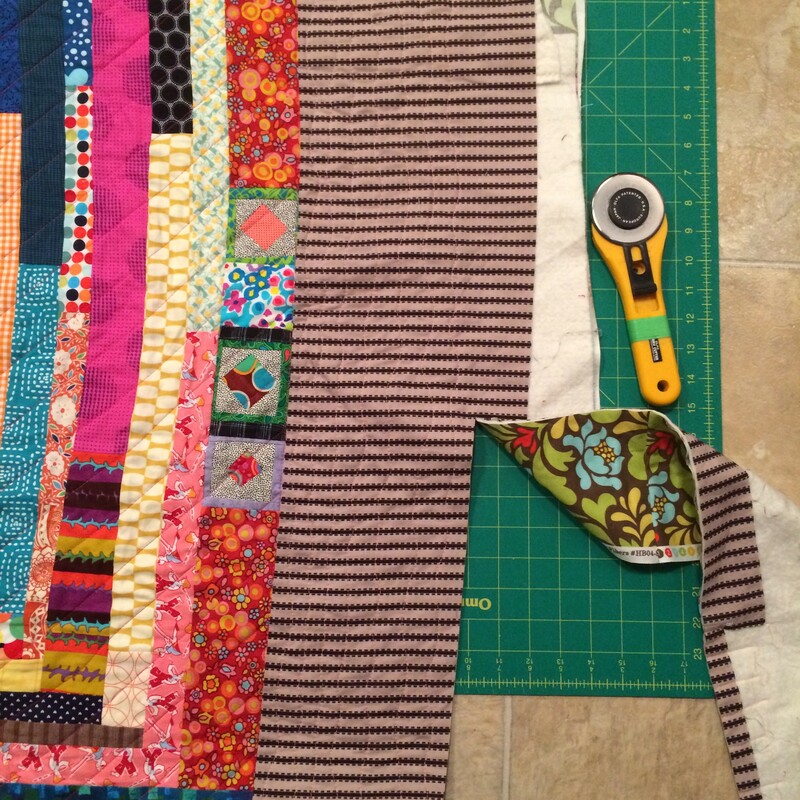 Life throws us curveballs and sometimes all we can do is make a quilt and embrace the wobble. 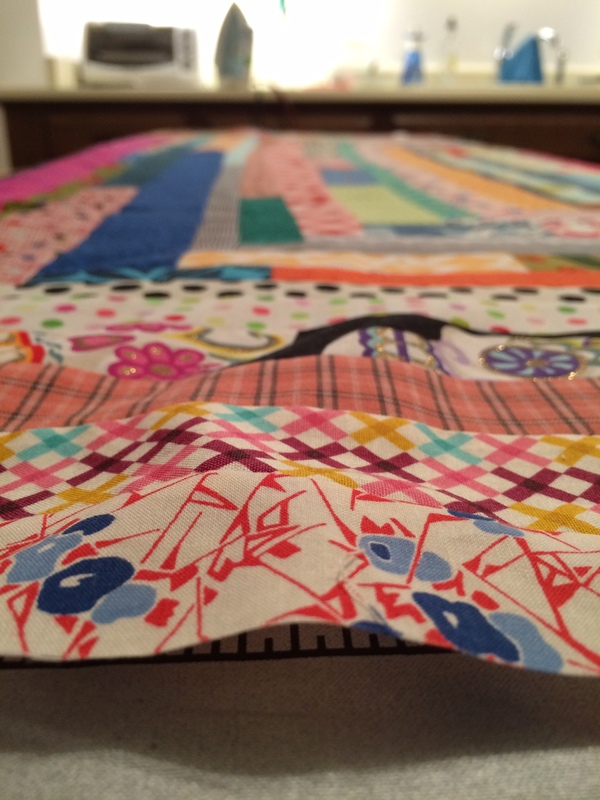 How’s your quilt coming along for the New York Modern Quilt Guild Double Wedding Quilt Challenge? Mine? Not so much. 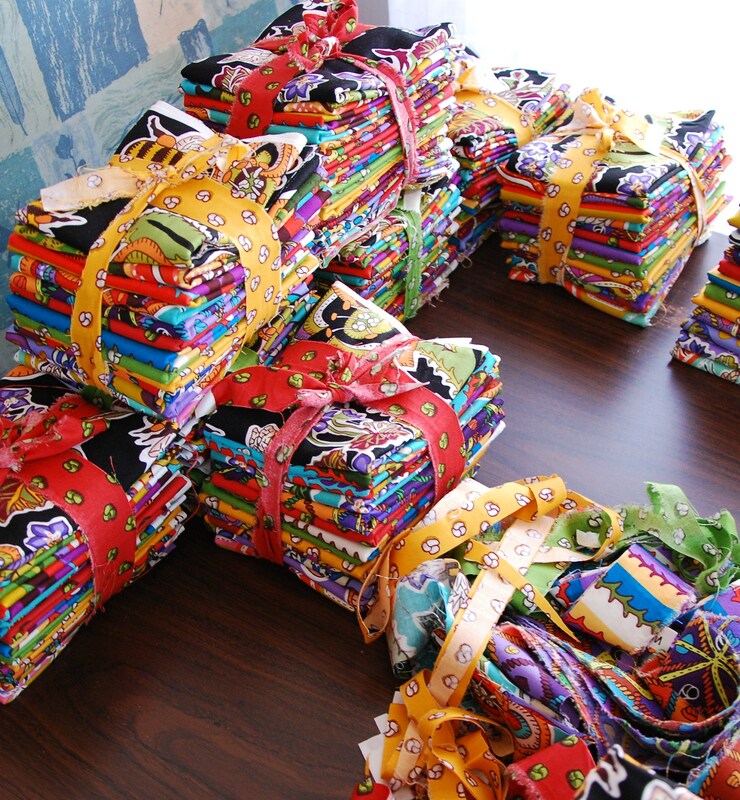 But today I received my daily email from The Quilt Alliance blog (you do know about them, don’t you?) and I may have to start one. Like, now. See what I mean. Don’t get me wrong. 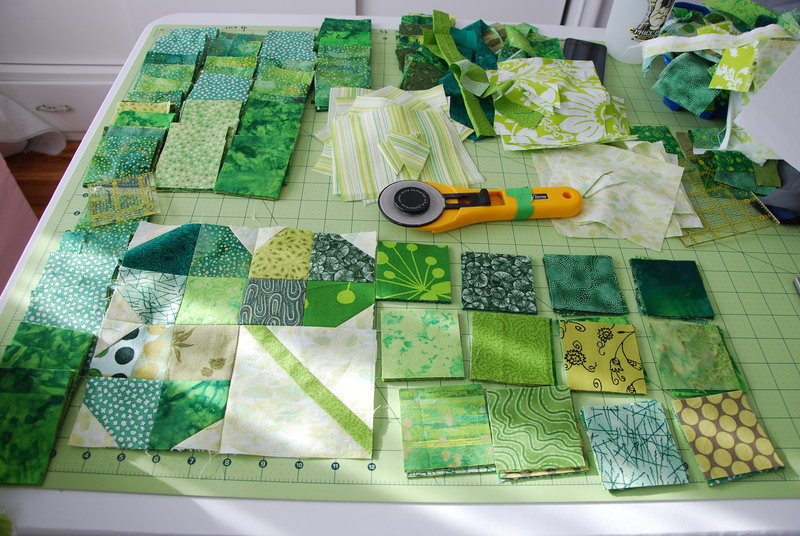 I love the traditional look of a Double Wedding Ring quilt, and I am especially fond of the Pickle Dish variation and hope to make one one day. But this quilt. MAN, oh man. 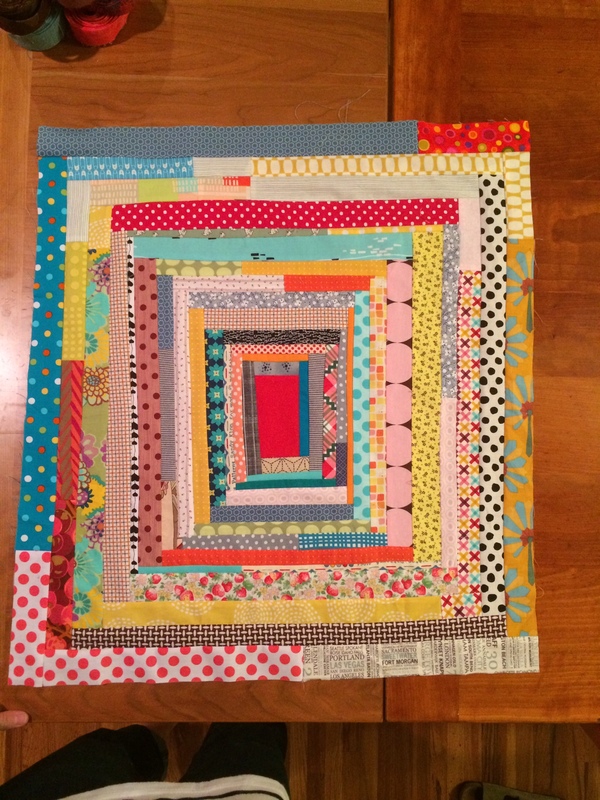 As I wrote to some friends today–I love, love, love, love, love this quilt. 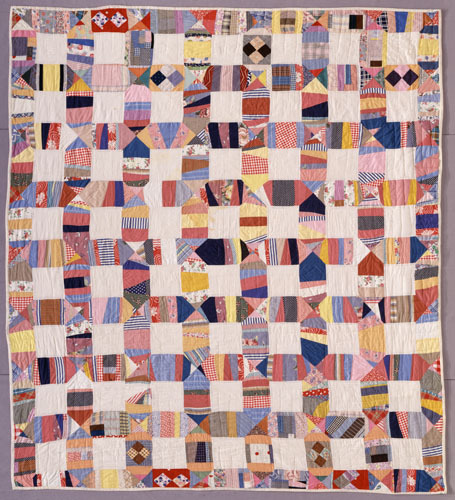 As a liberated quilter, this one has so much more appeal to me and has such a modern feel. But check the date, yo. 1930s. I realize it isn’t a true DWR, but it sure feels like a very interesting “modern” interpretation of one. And it’s made with strings. Note to self: Add this to list. 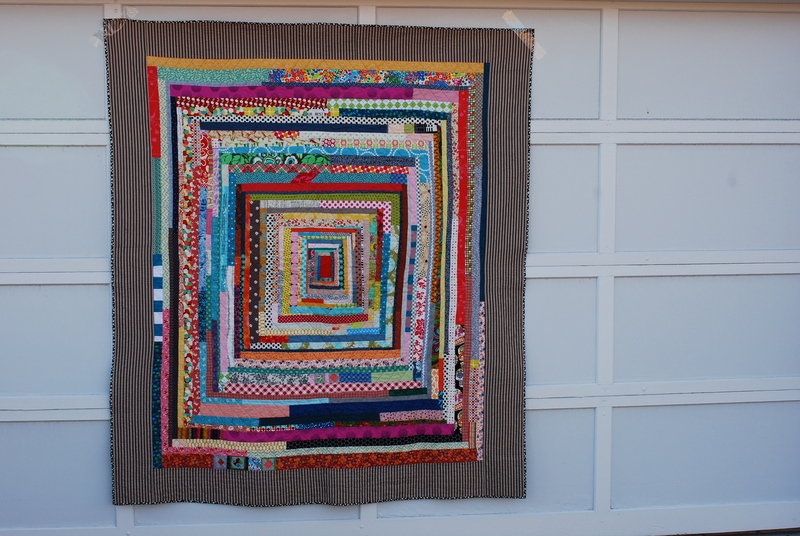 To find out more about this fabulous quilt, check the full entry here. Do you ever have one of those days where you run across something and realize–I HAVE TO STOP AND MAKE THIS RIGHT NOW!!! I was plugging away on this minding my own business when I read Sarah’s post telling me to get to the Gen Q site ASAP to 1) help them out and 2) get her shamrock tutorial. And so I did, and now I can’t stop. I dug unto my “stash o’green” and pulled out a tall stack. 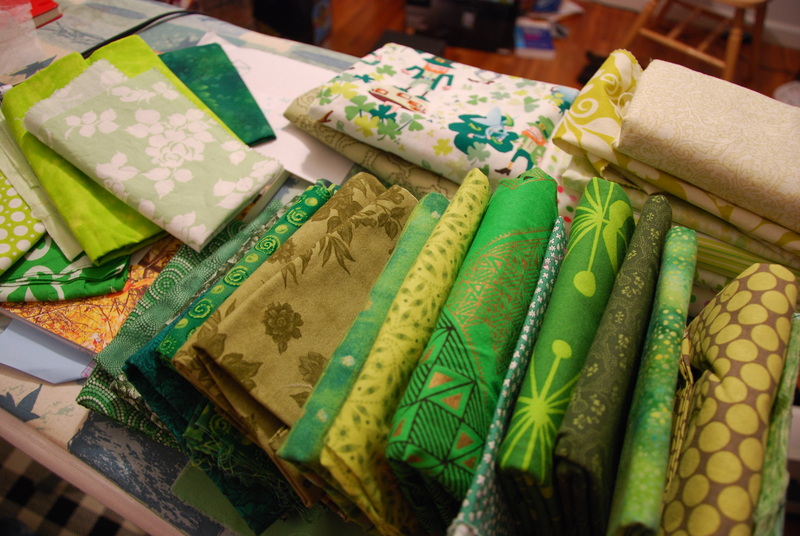 There’s a diverse mix– uglies, favs, goodies, newish, the-what-was-I-thinking-to-buy-a-whole-yard-of-this-crap, my “skuzzy” greens. Definitely plenty to choose from (I like green). So I took my pile and worked really fast. Tearing large sections, pressing, stacking, and cutting. 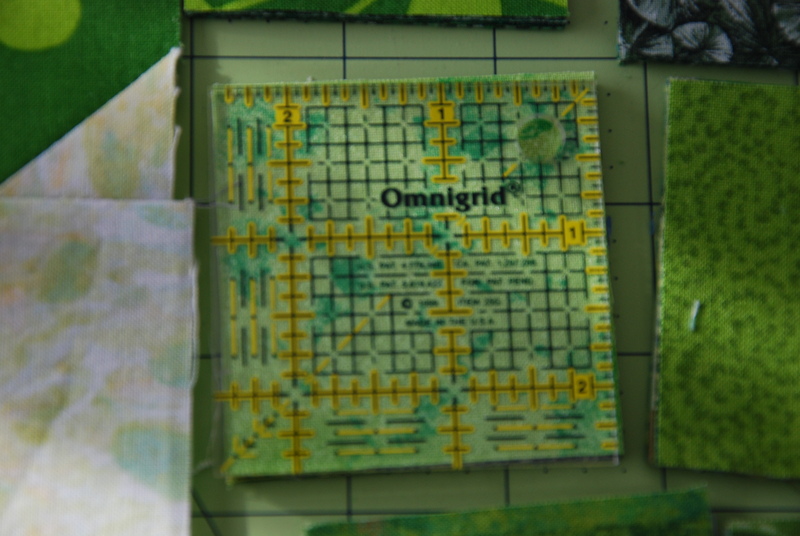 I finally put to good use that little 2 1/2″ Omnigrid ruler. Isn’t it cute! Before I new it I had a large grouping of squares to work with and I found once I got the hang of it I could assemble a block in 15 minutes. I’m working it chain piecing and assembly line style as much as possible. But here’s the thing with using a mix of fabrics (some you don’t like as much as maybe you used to). This block is FORGIVING. It takes all these green things (heinous and fabulous) and mixes ’em up and makes it all look good. At least I think so. 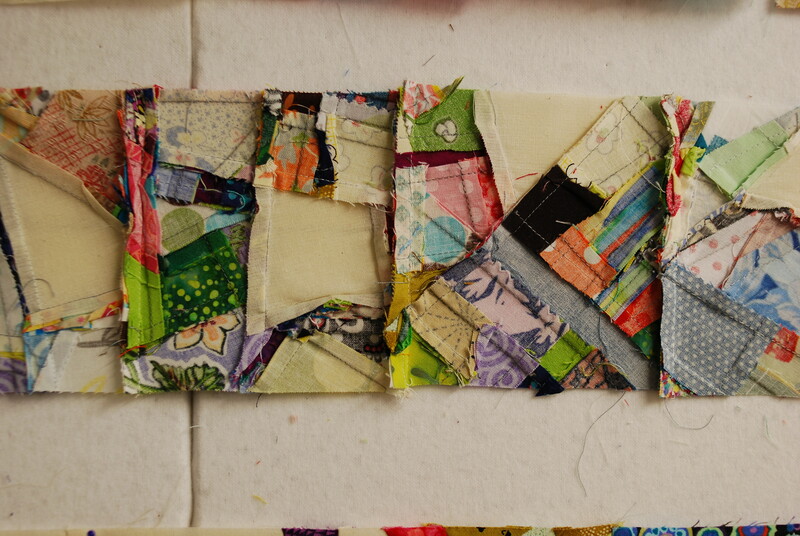 I must admit, part of the appeal of this block besides burning through my greens is the thought that I finally have a use for this quirky Alexander Henry fabric I’ve had in my stash since 2002 (according to the selvedge). I bought it on sale thinking it would be fun in a kids quilt. I’m always doing that. Ironic that I don’t have kids. Hopefully there is a kid in the Basics program that will like it. I’ve done a handful of blocks in the evenings this week. Many more to do. I’m not sure how I’ll end up setting them, or what I should pair them with. Truth be told, I’m feeling like they are really cute but a little monotonous. 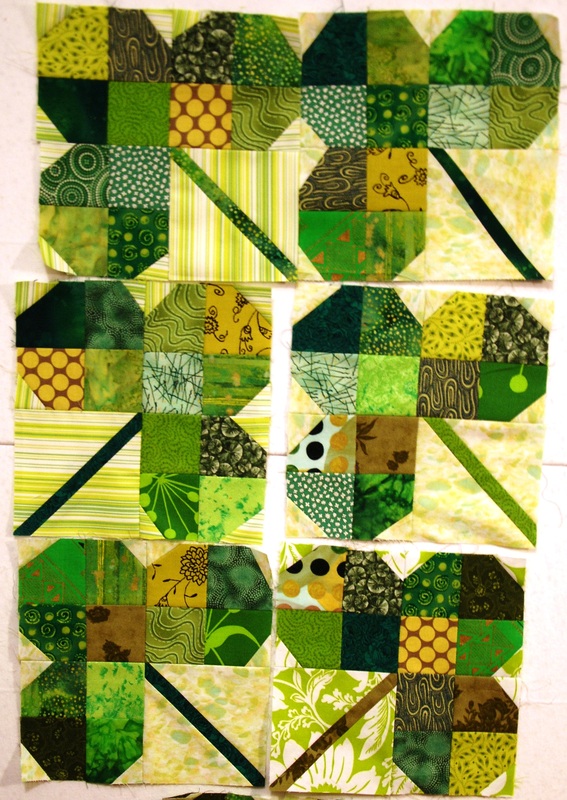 I’m thinking of making a couple four-leaf clovers and maybe some other blocks to add a little variety. 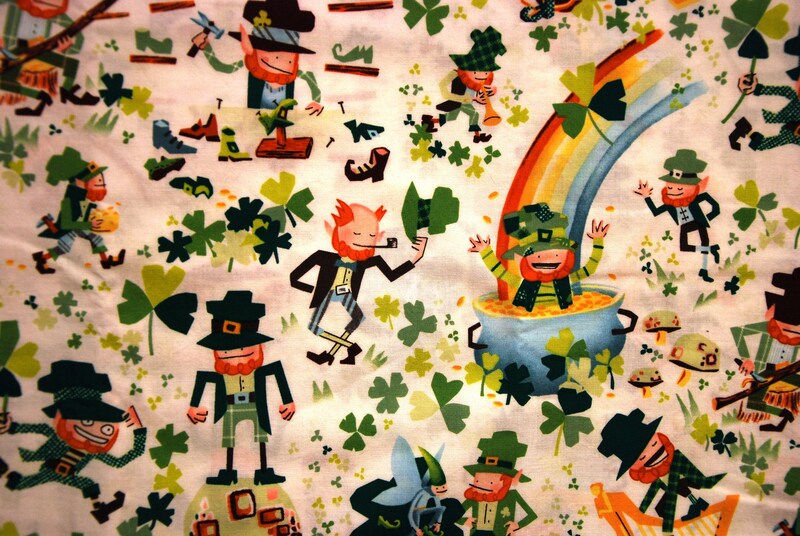 The name sticking in my head on this one is Lucky Charms which reminds me of the marshmallow cereal I used to eat as a kid, and is also the name of the Leprechaun fabric. Maybe I need pink hearts, yellow moons, orange stars, and blue diamonds. Or maybe some rainbow blocks with curve piecing. Hmmm…something to think about. While at my old job (that’s another post for another time) I had the opportunity to meet, work, and partner with some fabulous people—fabric companies, quilt designers, fabric designers, notion geniuses (genii? ), creative directors, marketing directors—the list goes on. Fall and Spring Quilt Market is like one crazy reunion of all these people united under one roof for all things quilt. As an editor, it was exhausting and rejuvenating all at the same time. At one such market (I think it was Fall 2010) which debuted the fabrics that would be released the following spring, I fell in love with Terrie Mangat’s (then) new line—The Bee’s Knees—for Free Spirit Fabrics. It’s the bee’s knees indeed. With its funky color palette, more is more aesthetic, and the at once whimsical and wacky designs, it is pure Terrie. In the Free Spirit booth hung a stunning and complex quilt which ultimately would become a free pattern on the company’s web site. It was this design that originally caught my eye as hexagons were just barely starting to experience a rebirth in the quilting community. I wanted to get a design like this to my readers. As a scientist I was drawn to the clever pairing of hexagons with bees on the fabric. Plus, I’m a sucker for simple repetitive geometry. I wasn’t able to work out an arrangement with Terrie before I resigned, but fortunately for me, Nancy from Free Spirit hooked me up with a HUGE box of every SKU in the collection. Like somewhere around 100+ yards. What can I say—I’m a REALLY lucky girl. I LOVE this line, but I don’t know that I love it 100 yards worth. 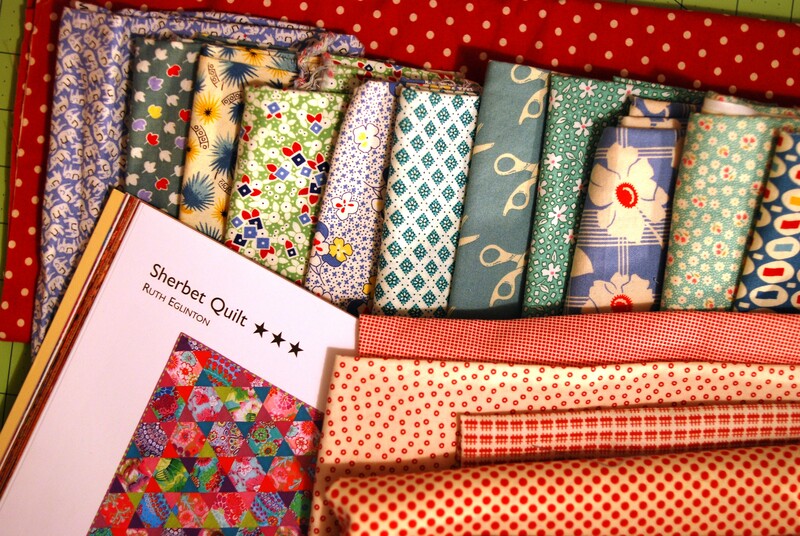 So what was a quilter to do? I decided to bundle it up and offer it to members in my guild—with strings attached. Behold: The Bee Hexed Challenge. Ten players hopped on board, with some having blogs and agreeing to share their work in progress.Their addresses are buried somewhere here (under piles of fabric)–I’ll share just as soon as I find them. 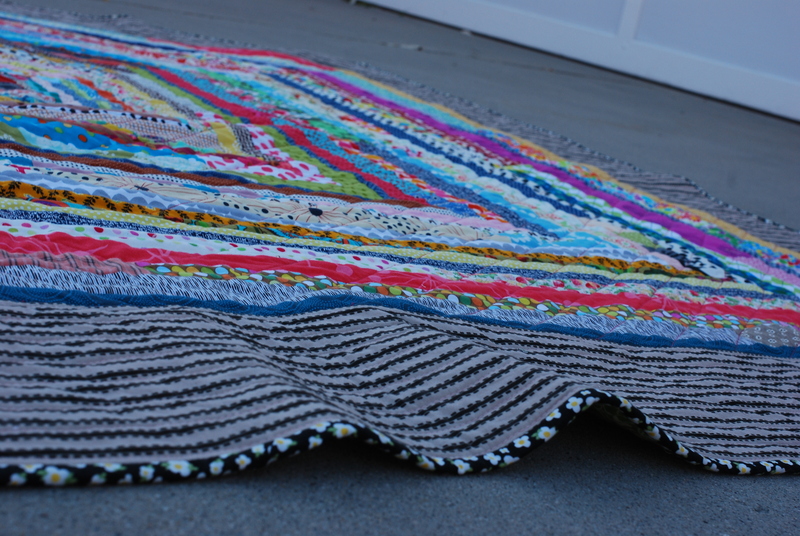 In the mean time I’m keeping with the Free Spirit/Rowan/Westminster theme I’ve started by deciding on the “My Fair Lady” quilt by Brandon Malby in Faffe Fassett’s Quilt Road. This quilt will go to one of the new twin cousins in Taiwan. Progress posts soon to follow. I am Auntie to a sweet curly-strawberry-haired boy named Charlie. 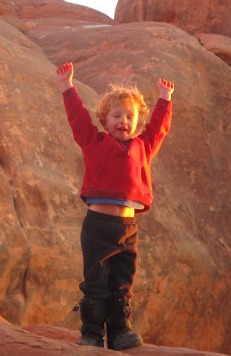 He turned three in December and it seems like yesterday that I was at his birth. I had been working on a quilt for him for ages, that I was going to “boomerang” back to his momma, my SIL. 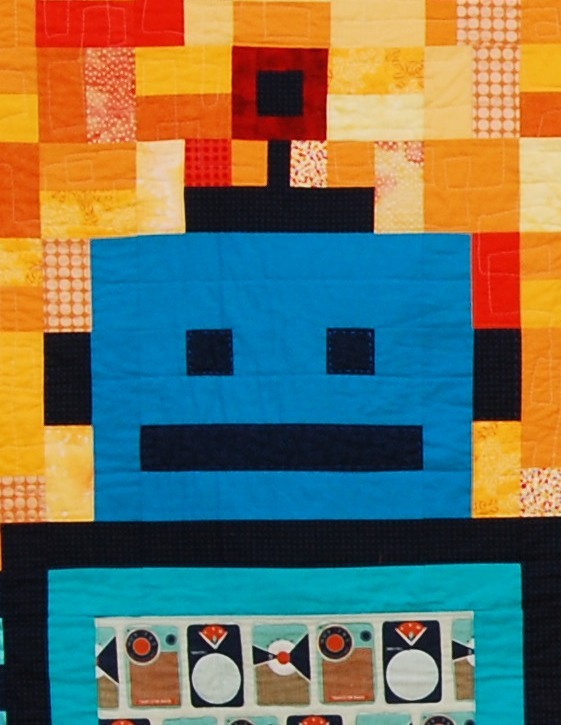 Needless to say, I’ve never finished it (but I do have plans), and instead decided two weeks before said birthday that this boy needed a “wo-bot” quilt to go along with his robot OBSESSION. Fortunately for me, Boo Davis has a smashing robot quilt in her (self-described sickeningly cute) book Dare to Be Square Quilting. You need this book. Trust me.